Dr. Boatright is a Professor in the Department of Ophthalmology and a Research Biologist and Core Director at the Atlanta Veterans Administration Medical Center. He is a graduate of Brown University (ScB in Neural Sciences and Experimental Psychology) and Emory University (PhD in Pharmacology and the Neurosciences Training Program). He joined the faculty of the Department of Ophthalmology in 1999, conducting research on the regulation of retinal gene expression, a study funded by an R01 grant from the National Institutes of Health National Eye Institute (NIH NEI). This research expanded into using endogenous DNA repair mechanisms to treat genetic mutations that lead to blindness. Currently Dr. Boatright is exploring whether physiological preconditioning stressors such as bright light, whole-body exercise, and mild hypoxia/ischemia elevate DNA repair rates, also funded by an NEI R01. This has led to separate projects testing the effects of exercise in rodent models of retinal degeneration, diabetic retinopathy, and glaucoma. Some of this work has extended to testing effects of exercise on visual functions in humans, a project supported by individual and program grants from the Veterans Administration. In a separate project, Dr. Boatright uses in vivo pharmacological approaches to explore the effects of atypical, endogenous compounds on animal models of retinal degeneration and glaucoma. This work has been funded by the Katz Foundation, Foundation Fighting Blindness, NIH National Center for Complementary and Alternative Medicine (NIH NCCAM), and a Center Award from the Veterans Administration. Currently Dr. Boatright is principal investigator or co-investigator in four NEI grants, three VA grants, and two private foundation grants. 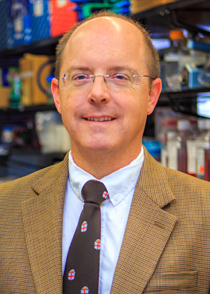 Dr. Boatright is founding and current editor-in-chief of Molecular Vision, a peer-reviewed online journal dedicated to the dissemination of research results in molecular biology, cell biology and the genetics of the visual system. The journal is ranked second in a field of 14 competing journals and is routinely used as an open access exemplar by the National Library of Medicine and The National Institutes of Health Library. The journal is supported by international and local academic partnerships and through initiatives generated in the Department of Ophthalmology. Dr. Boatright also serves on the editorial boards of two other journals. Dr. Boatright is on the Board of Governors of the Association for Research in Vision and Ophthalmology (ARVO), the preeminent professional society for vision research nationally and internationally. Prior to this, he served for seven years on the Board of Trustees and was President in 2011-2012. He was designated a Silver and then a Gold Fellow in 2010 and 2012, respectively, in recognition of his individual accomplishments, leadership, and contributions to the Association. In 2016-17, he successfully led the effort to create and publish an online education course that bridges all aspects of basic, translational, and clinical vision research. Dr. Boatright directs IBS548, the graduate portion of the course BIOL475 “Biology of the Eye.” He routinely lectures in courses offered by EUSOM’s Office of Faculty Affairs and Professional Development and the Office of Postdoctoral Education.